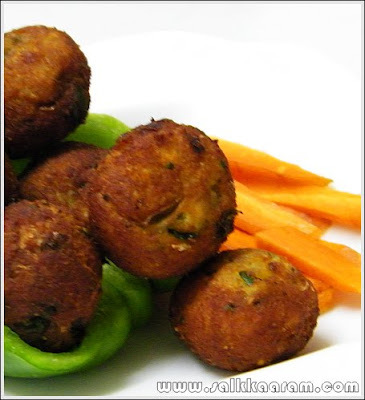 Chemmeen Vada / Prawn Balls | Simple and Delicious ! Eid Mubarak to all readers! Hope you had a great spiritual treat during this Ramadan. Now all of you would be busy planning and preparing a delicious Eid meal.. Here we normally make a chicken biriyani, which is the easiest, serves along with raita , pudina chammanthi or some pickle.We would meet so many relatives on Eid day, that is the happiest part, I think. 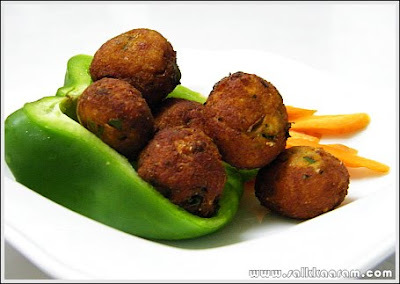 Here is an easy snack for you to serve joyfully in the eid evening.. Enjoy! Apply salt on prawns, steam it for 10 minutes. Crush it in a grinder. Crush chopped onion,curry leaves and green chilly too. Make bread crumbs using the bread slice. Break egg into a bowl. Mix the crushed ingredients with chopped coriander leaves, salt,rice powder, bread crumbs,garlic ginger paste and egg. Deep fry these in oil. Wow! it looks like a great and mouth watering. I gotta try this one sometimes, will read and try your other recipes too. I am gonna add your site to my favorite list at my blog - http://vulusrecipe.blogspot.com. just would like to know, if these... the prawn balls can be made in advanced, and frozen? helps for a working mother! !